Muscular spasms can be caused by calcium deficiencies. Nervous reactions can be diminished by magnesium. However, these minerals are not well absorbed unless supplied in an acidic form. 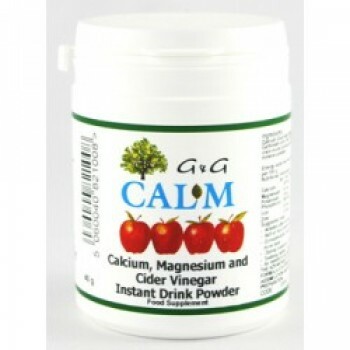 Cal-M supplies calcium and magnesium along with organic cider vinegar to create that optimum acidity, allowing for far greater absorption than taking calcium and magnesium through other means. The formula is premixed and dried, so all you have to do is add water to get that perfect mix of calcium and magnesium. In addition, Cal-M also provides traces of potassium, phosphorous, zinc and iron. Did you know that calcium and magnesium, apart from being good for bones and teeth, are important for muscle and nerve function and are required for many metabolic processes, for example calcium is required for blood clotting, magnesium for the synthesis of nucleic acids? Most calcium/magnesium preparations are in tablet form which makes them difficult to digest for most people. Cal-M is a powder which supplies calcium and magnesium as acetates, with organic cider vinegar to create the optimum acidity. Pre-mixed and dried, it also provides traces of potassium, phosphorous, zinc and iron. If you have an intolerance to dairy products, you will be delighted to know that one teaspoon of Cal-M contains calcium/magnesium resembling 100 grams of cow's milk (164 mg calcium and 12.6 mg magnesium). Mixed with boiling water, Cal-M makes a pleasant, easily digested and rapidly absorbed drink (and it has NO other ingredients or additives). It is particularly recommended at the end of the day. Ingredients: Cal-M Powder and that's all. This product contains no gluten, wheat, lactose, added sugar, preservative, colouring, yeast, drug or tranquillizer.